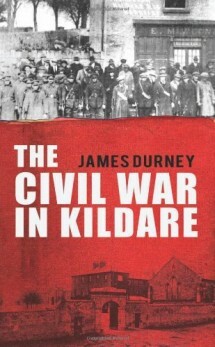 During the War of Independence Co. Kildare, as a garrison county with military barracks situated on the main Cork and Limerick roads in Naas, Newbridge, the Curragh and Kildare town, had a low level of Republican military activity. By the Truce of 1921, however, Kildare’s two IRA battalions had evolved into quite efficient military units. The Civil War left its mark more violently on the county – forty three people, in or from Co. Kildare, died during 1922-3, while fifteen people died in the 1916-21 period. Kildare had the highest amount of IRA volunteers executed during the war – eight – and the largest single execution – in December 1922 when seven men from the Rathbride column were executed at the Curragh. Fifteen National Army soldiers were killed in ambushes in the county, yet only three RIC men died. Two internment camps – Tintown and Newbridge – housed nearly 3,000 prisoners in 1922-3, while the Rath Camp held 1,200. The internment camps were the scene of mass hunger strikes and mass jail-breaks and the escape from Newbridge is the biggest in republican prison folklore, with 112 prisoners getting away. Includes the full untold story of the Rathbride column when 7 out of 10 arrested were executed in 1922 while other prisoners in Kerry caught in the same circumstances were reprieved.